On July 7th, I wrote a blog about a film I saw when I was at Omega Institute – Moving from Emptiness: the Life and Art of a Zen Dude. In the last few weeks it has become available for purchase. In this time period of gift giving, this would be an inspiring and heart-warming gift for those people on your list who are seekers. You can at least go to the website and check out a trailer. The link would be www.zendudemovie.com. For those of you interested in doing an entire weekend doing and learning about Qigong I will be doing a 2-day class January 17 &18th at Transformational Acupuncture at 1645 Connecticut Ave., NW, 3rd floor, Washington, DC 20009. It will be for the public and acupuncture practitioners. We will be learning the basics about Qigong and the Daoist 5 Yin Qigong set. For more information, please look under Calendar. The skin is the largest organ in the body. And in Chinese Medicine it is considered the 3rd lung. In some way it’s your first line of defend. Sometimes when you are around something that is toxic, or you have an allergy, the first thing that you might notice is a skin rash. Or you might notice if you use certain oils on your skin, makeup or skin products that you have a reaction. It’s your body’s way of giving you fair warning. You really are breathing in and out through your skin. This brings me to the matter of the qigong class that I just finished. 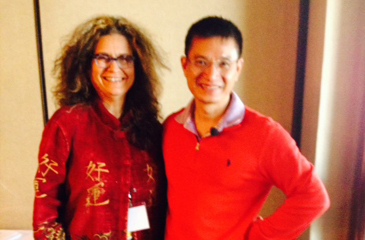 The past 3 days I’ve been in San Diego studying with Robert Peng, a well-known Qigong Teacher. One of the many things that I learned was that as we would begin to do Qigong was that instead of saying to focus on your breathe, he would say now breathe and begin to breathe through your skin, in and out. As I did this it felt like I was using my skin for the first time to breath in the clear and breath out the toxic. I felt like I was really using the idea of the breath differently noting that this is another way to breathe. I felt more invigorated when I was doing the exercises and I marveled how making this change would make such a huge difference. So if you are practicing qigong change the set and begin by breathing in and out through your skin. I found so much about that was so useful in studying with Master Peng, that I can easily recommend that it is definitely be valuable for anyone to study with him. You can find his information at www.robertpeng.com. There are also videos available on YouTube. There is something magical about how being a practitioner of Chinese Medicine. It is not only an exciting daily work, but it also provides a way of life that gives an ever-increasing appreciation of the seasonal shifts. You might note subtle shifts in the air or the color of the leaves, or the temperature, but there is an accompanying internal shift that we need to mark to stay healthy in the seasons. It’s listening to these shifts, which provides you with your internal wisdom on what you need throughout the year. The Chinese calendar marks the shifts in two-week periods, so that every season has 6 terms of 2 weeks. For instance, today November 7 is the first term of winter. It is the moment when most of the grains are harvested and stored. Some animals begin to hibernate. During this first week of Winter in some parts of China there would be animal sacrifices to heaven, the family ancestors, and to the earth. There are many other ways of community celebrating this shift. For me, I notice it is going quickly from hot to cold each day as it always does between seasons. And I notice every tree that still holds its colorful leaves and I accept that they will hurriedly be coming down. 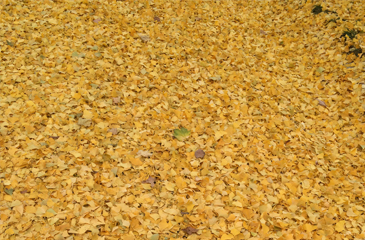 I like taking a pause here and waiting to watch the color of leaves piling up before they all fall. I smile as I greet the coming of Winter. Enjoy the changes.